Andreas Scheiger celebrates the "craft of etching, engraving and letter design" as an homage to science, paleonthology and graphic design. Scheiger believes that letters are "full of life" and, in an effort to explore "the means of communication" he delves into the heart of typography with his sculptural letter series, The Evolution of Type. The Evolution of Type is an ongoing project, inspired by type designer Frederic W. Goudy's book The Alphabet and Elements of Lettering, in which the Austria-based artist Andreas explores lettering in the same manner that a paleontologist might investigate a dinosaur fossil. In his extensive analysis of typography, Scheiger creates everything from illustration to sculpture. 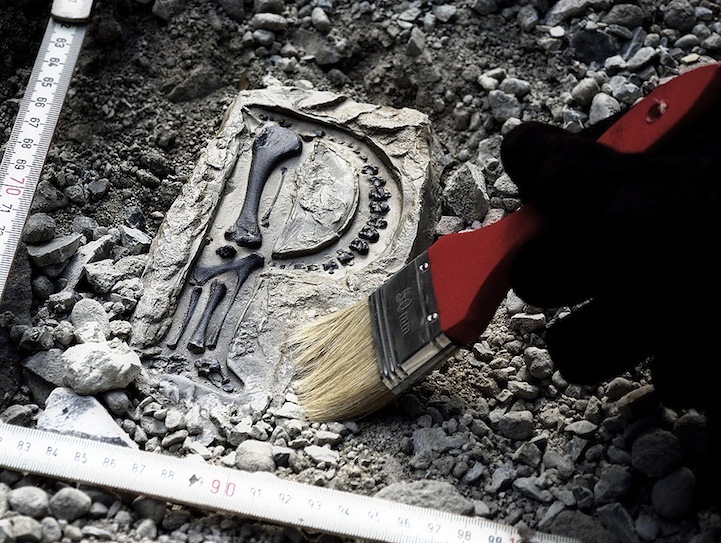 The work seen here, Type Exhibits 22-26, is built out of wood, gypsum, plasticine, chicken bones, and water colors to form the fossilized letters. According to his website, "Andreas Scheiger interpretes letters as organisms and typefaces as species, all classified similar to biological taxonomy. Each letter displays the anatomical features and evolutionary characteristics shared by so many living creatures."